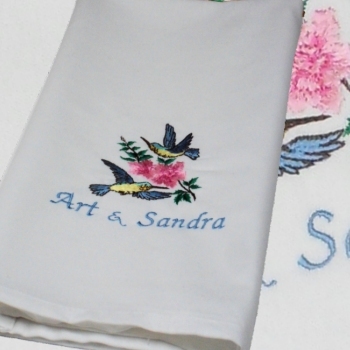 Personalised embroidered tea towel with Hummingbirds and flowers. Personalised embroidered tea towel with Hummingbirds and flowers. All cotton tea towel hemmed on all the sides. A good size tea towel at 52 x 72cm long approximate. Personalised embroidered tea towel with Hummingbirds and flowers. All cotton tea towel hemmed on all the sides. A good size tea towel at 52 x 72cm long approximate. Choose from natural cotton, white cotton or upgrade to a pure linen tea towel. You can have any names or little message! This Hummingbirds tea towel makes a great gift for Anniversaries, Weddings and birthdays! Choose a thread colour for the text and the letter font style you prefer. Amys Gifts will custom embroider your gift within 1-3 days.